Monument commemorates the community assistance in the area to victims of the 1977 bushfire. In February 1977 , bushfires saw farms, houses and township properties in the Rokewood, Cressy, Mingay-Lismore, Pura Pura and Derrinallum areas affected. Five people, 190000 sheep and 3300 cattle were killed while 2 million bales of hay, 79 houses, and 3800 kilometres of fencing were destroyed. 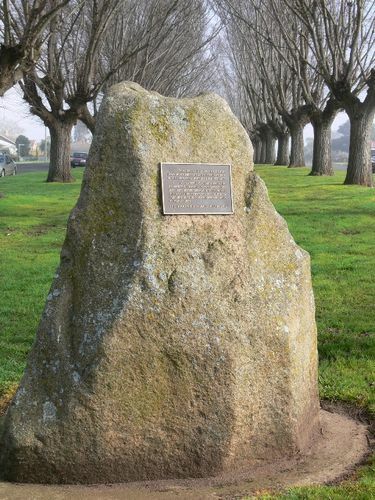 The Dromana firefighters suggested the idea of a memorial and provided a large slab of Dromana rock to be the "heart" of the memorial. 85 of the 95 property owners who were affected by the fire contributed to the plaque. Mr Keith May of Derrinallum devised the wording on the plaque. In The Pura Pura Derrinaluum Districts.